Kingsfoil, a duo from York, PA, has some of the catchiest, most addictive and most eclectic music that I’ve ever heard. They describe their sound as “indie acoustic rock, with a focus on melody and lyrics.” Their sound is amazing, and I find myself looking for reasons to put them on and sing along. No two songs sound alike. Their vocals can remind me of anyone from Duncan Shiek to Brian Vander Ark to Eddie Vedder. 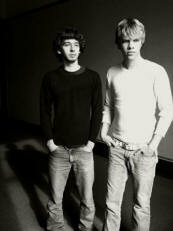 The duo consists of Jordan Davis and Tristan Martin, both providing vocals, guitar, and piano during various pieces. Both Tristan and Jordan have been involved with music for many years. Jordan originally started his musical pursuit with the drums, and later expanded to the guitar and keyboards, and he now writes many of Kingsfoil’s lyrics. Tristan has been performing for years, in everything from theater bands to rock and jazz bands, and has talent in guitar, bass and piano. Both grew up surrounded by music, and its influence has led them to be able to create songs that anyone can relate to. To their credit, Kingsfoil was chosen as one of the 3 out of 75 bands to perform at First Night York© in 2003, won the 2005 York Country Day Battle of the Bands, and was chosen to perform at the 8th Annual Millennium Music Conference. While you can find some free downloads at www.kingsfoil.com, www.myspace.com/kingsfoil, and www.purevolume.com/kingsfoil, I very highly recommend that you purchase their newest album, “Blueprints.” It’s an outstanding compilation, which gives you a great taste of the pair’s diverse abilities. You can pick up a copy at www.cdbaby.com/kingsfoil, or Tower Records’ website, www.tower.com. You can also purchase digital downloads at www.itunes.com, www.aol.com, and www.virgindigital.com.